Please read and please enjoy reading your Bible this year! 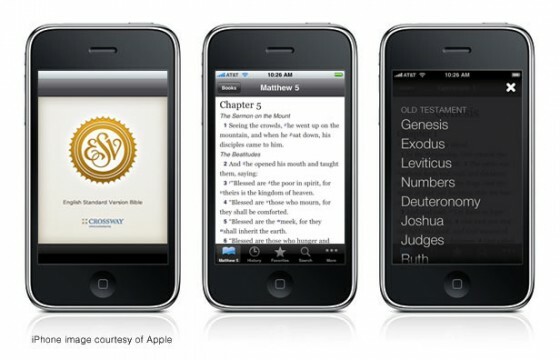 (Those who want to bore into the details of how long it takes to read each book of the Bible can visit howlongdoesittaketoreadthebible.com). George Guthrie’s “Read the Bible for Life Chronological Bible Reading Plan” is takes you through the whole Bible in the basic order of events, with a reading each day. There’s also a 4 + 1 plan (similar to the others, in that you read from four different places each day plus the Psalms). But it’s a semi-chronological plan, placing the prophets and the NT letters in basic chronological order. Trey Hunter’s “The Bible-Eater Plan” is an innovative new approach that has you reading whole chapters, along with quarterly attention to specific books. The plan especially highlights OT chapters that are crucial to the storyline of Scripture and redemptive fulfillment in Christ. Below are Goldsworthy’s summaries of each section. In the beginning God created everything that exists. He made Adam and Eve and placed them in the garden of Eden. God spoke to them and gave them certain tasks in the world. For food he allowed them the fruit of all the trees in the garden except one. He warned them that they would die if they ate of that one tree. The snake persuaded Eve to disobey God and to eat the forbidden fruit. She gave some to Adam and he ate also. Then God spoke to them in judgment, and sent them out of the garden into a world that came under the same judgment. Outside Eden, Cain and Abel were born to Adam and eve. Cain murdered Abel and Eve bore another son, Seth. Eventually the human race became so wicked that God determined to destroy every living thing with a flood. Noah and his family were saved by building a great boat at God’s command. The human race began again with Noah and his three sons with their families. Sometime after the flood a still unified human race attempted a godless act to assert its power in the building of a high tower. God thwarted these plans by scattering the people and confusing their language. Sometime in the early second millennium BC God called Abraham out of Mesopotamia to Canaan. He promised to give this land to Abraham’s descendants and to bless them as his people. Abraham went, and many years later he had a son, Isaac. Isaac in rum had two sons, Esau and Jacob. The promises of God were established with Jacob and his descendants. He had twelve sons, and in time they all went to live in Egypt because of famine in Canaan. In time the descendants of Jacob living in Egypt multiplied to become a very large number of people. The Egyptians no longer regarded them with friendliness and made them slaves. God appointed Moses to be the one who would lead Israel out of Egypt to the promised land of Canaan. When the moment came for Moses to demand the freedom of his people, the Pharaoh refused to let them go. Though Moses worked ten miracle-plagues which brought hardship, destruction, and death to the Egyptians. Finally, Pharaoh let Israel go, but then pursued them and trapped them at the Red Sea (or Sea of Reeds). The God opened a way in the sea for Israel to cross on dry land, but closed the water over the Egyptian army, destroying it. After their release from Egypt, Moses led the Israelites to Mount Sinai. There God gave them his law which they were commanded to keep. At one point Moses held a covenant renewal ceremony in which the covenant arrangement was sealed in blood. However, while Moses was away on the mountain, the people persuaded Aaron to fashion a golden calf. Thus they showed their inclination to forsake the covenant and to engage in idolatry. God also commanded the building of the tabernacle and gave all the rules of sacrificial worship by which Israel might approach him. After giving the law to the Israelites at Sinai, God directed them to go in and take possession of the promised land. Fearing the inhabitants of Canaan, they refused to do so, thus showing lack of confidence in the promises of God. The whole adult generation that had come out of Egypt, with the exception of Joshua and Caleb, was condemned to wander and die in the desert. Israel was forbidden to dispossess its kinsfolk, the nation of Edom, Moab, and Ammon, but was given victory over other nations that opposed it. Finally, forty years after leaving Egypt, Israel arrived in the Moabite territory on the east side of the Jordan. Here Moses prepared the people for their possession of Canaan, and commissioned Joshua as their new leader. Under Joshua’s leadership the Israelites crossed the Jordan and began the task of driving out the inhabitants of Canaan. After the conquest the land was divided between the tribes, each being allotted its own region. Only the tribe of Levi was without an inheritance of land because of its special priestly relationship to God. There remained pockets of Canaanites in the land and, from time to time, these threatened Israel’s hold on their new possession. From the one-man leaderships of Moses and Joshua, the nation moved into a period of relative instability during which judges exercised some measure of control over the affairs of the people. Samuel became judge and prophet in all Israel at a time when the Philistines threatened the freedom of the nation. An earlier movement for kingship was received and the demand put to a reluctant Samuel. The first king, Saul, had a promising start to his reign but eventually showed himself unsuitable as the ruler of the covenant people. While Saul still reigned, David was anointed to succeed him. Because of Saul’s jealousy David became an outcast, but when Saul died in battle David returned and became king (about 1000 BC). Due to his success Israel became a powerful and stable nation. He established a central sanctuary at Jerusalem, and created a professional bureaucracy and permanent army. David’s son Solomon succeeded him (about 961 BC) and the prosperity of Israel continued. The building of the temple at Jerusalem was one of Solomon’s most notable achievements. Solomon allowed political considerations and personal ambitions to sour his relationship with God, and this in turn had a bad effect on the life of Israel. Solomon’s son began an oppressive rule which led to the rebellion of the northern tribes and the division of the kingdom. Although there were some political and religious high points, both kingdoms went into decline, A new breed of prophets warned against the direction of national life, but matters went from bad to worse. In 722 BC the northern kingdom of Israel fell to the power of the Assyrian empire. Then, in 586 BC the southern kingdom of Judah was devastated by the Babylonians. 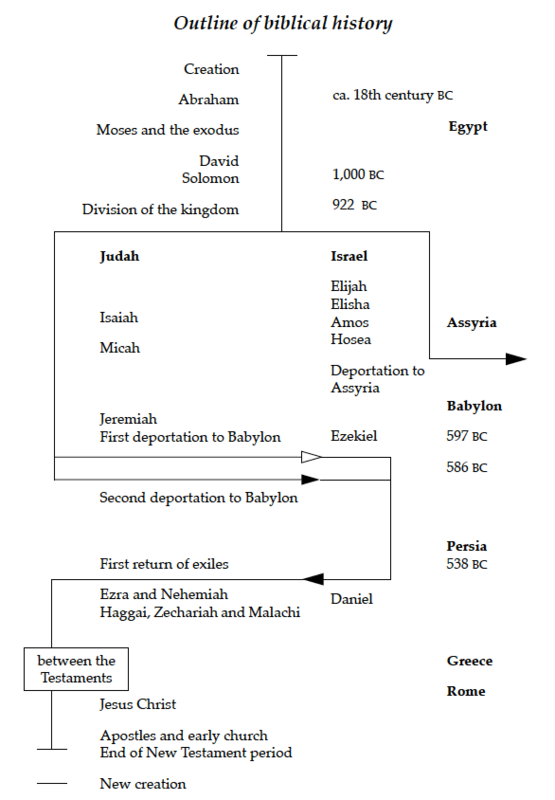 Jerusalem and its temple were destroyed, and a large part of the population was deported to Babylon. The prophets of Israel warned of the doom that would befall the nation. When the first exiles were taken to Babylon in 597 BC, Ezekiel was among them. Both prophets ministered to the exiles. Life for the Jews (the people of Judah) in Babylon was not all bad, and in time many prospered. The books of Jeremiah and Ezekiel indicate a certain normality to the experience, while Daniel and Esther highlight some of the difficulties and suffering experienced in an alien and oppressive culture. In 539 BC Babylon fell to the Medo-Persian empire. The following year, Cyrus the king allowed the Jews to return home and to set up a Jewish state within the Persian empire. Great difficulty was experienced in re-establishing the nation. There was local opposition to the rebuilding of Jerusalem and the temple. Many of the Jews did not return but stayed on in the land of their exile. In the latter part of the fourth century BC, Alexander the Great conquered the Persian empire. The Jews entered a long and difficult period in which Greek culture and religion challenged their trust in God’s covenant promises. In 63 BC Pompey conquered Palestine and the Jews found themselves a province of the Roman empire. The province of Judea, the homeland of the Jews, came under Roman rule in 63 BC. During the reign of Caesar Augustus, Jesus was born at Bethlehem, probably about the year 4 BC. John, known as the Baptist, prepared the way for the ministry of Jesus. This ministry of preaching, teaching, and healing began with Jesus’ baptism and lasted about three years. Growing conflict with the Jews and their religious leaders led eventually to Jesus being sentenced to death by the Roman governor, Pontius Pilate. He was executed by the Romans just outside Jerusalem, but rose from death two days afterward and appealed to his followers on a number of occasions. After a period with them, Jesus was taken up to heaven. After Jesus had ascended, his disciples waited in Jerusalem. On the day of Pentecost the Holy Spirit came upon them and they began the task of proclaiming Jesus. As the missionary implications of the gospel became clearer to the first Christians, the local proclamation was extended to world evangelization. The apostle Paul took the gospel to Asia Minor and Greece, establishing many churches as he went. Eventually a church flourished at the heart of the empire of Rome. As the gospel made inroads into pagan societies it encountered many philosophies and non-Christian ideas which challenged the apostolic message. The New Testament epistles shows that the kind of pressures to adopt pagan ideas that had existed for the people of God in Old Testament times were also a constant threat to the churches. The real danger to Christian teaching was not so much in direct attacks upon it, but rather in the subtle distortion of Christian ideas. Among the troublemakers were the Judaizers who added Jewish law-keeping to the gospel. The Gnostics also undermined the gospel with elements of Greek philosophy and religion. God is Lord over history and therefore, when he so desires, he can cause the events of the future to be recorded. All section of the New Testament contain references to things which have not yet happened, the most significant being the return of Christ and the consummation of the kingdom of God. No clues to the actual chronology are given, but it is certain that Christ will return to judge the living and the dead. The old creation will be undone and the new creation will take its place. Luke 2 is one of the most read passages of scripture this time of year because in it we find recorded the account of the event leading up to the birth of Jesus Christ, the Son of God. As Luke 1 records the prophecy and announcement of the future saviors birth, and Mary’s Magnificat in celebration of this life-changing news (Luke 1:46-55), chapter 2 leads us into the narrative of Joseph and Mary’s journey to Bethlehem and the birth of Jesus (2:1-7). The coming of the King of Kings is announced and celebrated by angels and shepherds, indicating that the highest of heavenly beings and the lowliest of human servants are invited and commanded to worship Jesus. Despite all of the songs and pageantry that surround the Christmas season today, in 1st century Judea, the birth of a baby to a poor carpenter and his young bride would have gone relatively unnoticed. In fact, outside of a few shepherds, the angels of heaven, and the wise men from the East, it was an event that came and went without any fanfare. In the eyes of so many, he was just another baby. But Joseph and Mary knew better than that. The lowly shepherds knew better than that. The heavenly hosts who sang of his birth knew better than that. While he was just like any other baby in his helplessness and dependence upon his caring parents, Jesus wasn’t just any other person. Jesus was who the world had been waiting for. The word advent means “a coming into place, view, or being; arrival”. The birth of Christ was the ending of the world’s waiting for redemption because the redeemer had arrived. Specifically, the people of Israel, like Simeon, had been waiting for a deliverer or “messiah” for such a long time. But their understanding of the prophesied messiah was one of political deliverance; one who would rid the Jewish nation of its Gentile oppressors and who would establish the nation of Israel as a sovereign nation like in the days of David and Solomon. A king had been promised, and it was a king for whom they waited. And waited. And waited. But he did not come. Many tried to fill that role but they all failed. Every rebellion and revolution was met with swift and mighty force by their Gentile oppressors. Yet they continued to wait; and among those waiting for the advent of the messiah was the man Simeon, who was a man of faithfulness and righteousness and obedience to God’s holy word. He longed to see the days of deliverance from outside oppression. But more than that, he desired to see the faithfulness and fruitfulness of Israel restored. He desired to see God’s name once again exalted above all others and he prayed for the restoration of true faith and worship of God alone. The Holy Spirit was upon him, and his faithfulness to God in all those years of waiting was rewarded. How? He was told that he would not taste death until he laid eyes upon the messiah of God (“the Lord’s Christ”) (v.26). He was given the blessing of meeting the long awaited messiah. He got to see Jesus with his own eyes. Luke 2 tells us that Mary and Joseph brought Jesus to the temple as was the custom, to dedicate their son Jesus to the Lord God (v.22-24). And Simeon took the baby Jesus in his arms and worshiped God for fulfilling his covenant promise (v.29-32). Simeon called Jesus “the light for revelation to the Gentiles, and for glory to your people Israel.” This prayer of praise was significant because Simeon’s prayer indicated that the messiah promised by God was a light to both Gentile and Jew. Profoundly, Simeon declares what the prophets of old had spoken of the promised messiah; He would come to save both Jew and Gentile, for the messiah sent by God is given for the peoples of all nations. The entire world was groaning and waiting for deliverance. In all the time they had spent waiting, their faith was turned to false gods and idols made by human hands. But with the advent of Jesus Christ, the waiting for true deliverance from the darkness of sin and separation from God was over. Hope and life have been given, in the form of the perfect son of God, wrapped in human flesh. 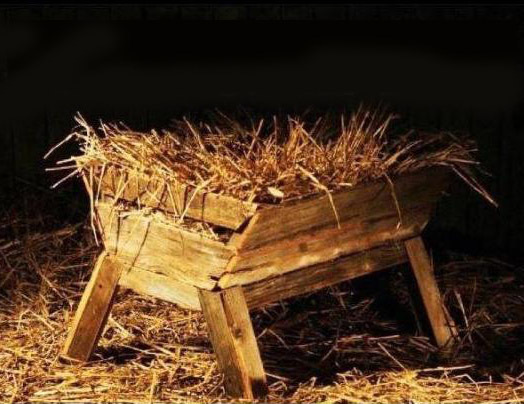 The great deliverer, prince of peace, and savior of mankind was given to us as a gift, born in an insignificant town, laid to sleep in a feed trough,and visited by dirty, undesirable herdsmen. The shepherds were just waiting for morning, but what they what they witnessed was the dawning of hope. They were waiting for the sunrise, but instead they were commanded to bow in worship of the one who created the sun. Just like you and me, Simeon and the shepherds, and the people of Israel, and all the people groups of the world were waiting. And right on time, by his divine plan and by his divine power God gave us Jesus, to be with us as one of us. He came and walked among us. He came and suffered with us and for us. He came to save us because we are completely and utterly helpless to save ourselves. The wait is over. Yet it seems that we continue waiting for the next great thing to come along. What we have in Christ Jesus is the greatest of all things, standing before us in complete life-changing love and mercy, calling us to stop and see him for who he is. Do you see him as he is? Will you look to him and call upon him and cry out to him for mercy and grace. Your waiting does not have to end in tragedy. There is deliverance for all those who trust in Christ Jesus. The baby in the manger is the man on the cross and the risen savior who sits at the Father’s right hand, waiting to come again. And until then, we will wait. As the 1st advent came and went with the incarnation of Christ Jesus, the Word of God, we now wait for the 2nd advent, or arrival. For Jesus promised that as he left this earth so will he return. But the next time Christ comes, it will not be as a baby, wrapped in swaddling cloths, and sleeping in a manger in humility and poverty. The next time we see Jesus with our own eyes, he will be coming in power and majesty and glory to take home all those who love his appearing (2 Timothy 4:8). And so we wait. And while we wait we know that He is with us even this very moment (Matt. 28:20). He knows us better than we know ourselves and yet he still loves us and cares for us and interceded for us. Imagine that! A holy savior who knows everything about you, and loves you more than you deserve. We can wait, like Simeon, with great expectation and anticipation for the blessing that will come when we finally see him as he is. That is a savior worth waiting for. We wait because we have hope in something better than this life, namely Jesus. We wait because Jesus is worth it. We wait because the consolation for this life is eternal glory. 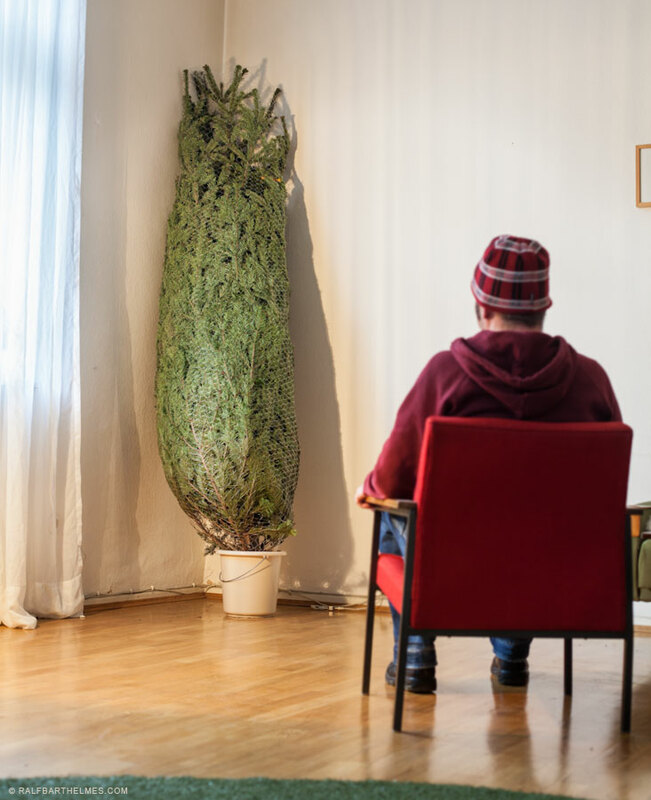 Christmas is all about waiting, but it is waiting with expectation. Not for things, but for the savior. And he is with us, right now, helping us to wait for him. So let this Christmas “advent” mean more to you than remembering the birth of Jesus. Let this advent point you to the magnificent love of God who comes to his people and save them to the uttermost. Praise be to God!